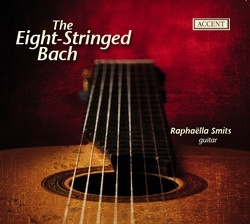 Raphaella Smits arranged Johann Sebastian Bach for eight-string guitar. "The idea of performing Johann Sebastian Bach on the guitar is not as incongruous as would appear at first sight. There are many examples which show how Bach himself designed a single piece to be performed in different arrangements – because, after all, the music is more important than the instrument. A good transcription or a good arrangement will not question the instrument performing it. It is obvious that – starting with a flute, lute or violin score – I have used the complete range of my eight-stringed Kolya Panhuyzen guitar. The richness of an instrument must serve the music totally without modifying what should be at its heart." Read more in english - french - german. "The virtuosity is allways for the benefit of the musical result. More beautiful music does not exist, more beautiful performances I can not image. Maximum recommended." "Raphaella Smits has made herself the arrangements for the Bach repertoire, and one can immediately conclude that she has managed this extremely well. And as she plays! One can rediscover these familiar pieces of music vibrating in the Rosario chapel when they come into being between her fingers and the eight-stringed guitar of Kolya Panhuyzen. There is an obvious joy and insight into her playing: all the pieces fall in the right place and one can only find that everything is correct. It is rare to hear such a well-defined recording, in a warm, yet clear sound where no tone is hidden behind another-one. It is such a successful record where all the elements fuse together in a perfection that make listening a pure pleasure. You play it over and over again, and imagine to have come closer to Bach himself! " "You recognize immediately Raphaëlla Smits' warm tone and sophisticated poetic timing. What makes this recording particularly clever are her smart arrangements for eight-string guitar. The famous baroque music certainly benefits from the extra bass: with the impressive register, the soloist has more possibilities and the modern guitar can compete with the baroque lute or organ. The rhetoric is so well put that the music - full of dialogues and surprises - not once gets boring, you get one long story from beginning to end. This CD is to enjoy from the first to the last second.". "... the Partita Secunda a violino solo senza basso of J.S. Bach, with a very attractive transcription for eight-string guitar made by the gitarist herself. A Baroque performance with a refined taste like not many players can do, and she shows us that it is possible to disclose the most pure romanticism in this music style, always so complex to play. Due to this Raphaella Smits has moved us deeply." "I have never heard Bach presented with so much sensitivity. Raphaella reads Bach's soul and interpreets an entire gamma of feelings like it has never been dared before, maybe because it was never experienced. To me this performance is a revelation and a confirmation." "Polyphonic Bach on an 8-string guitar? Yes! - every complex living element of it - the very soul of the music alive and breathing. A fabulous performance of Bach. Quite extraordinary, exciting in a way I had never - in my wicked musical snobbery - thought the classical guitar could be."